Editor's Note: One of my only good qualities is that I can diligently badger people via all forms of digital communication in order to get them to contribute to this blog. It's not that I am especially convincing, it's more that the people I choose to badger are kind souls who are willing to do me a favor so that I'll go away. Today's contributor is certainly one of those kind souls. Mackenzie Schmidt is the Assistant Digital Editor at Architectural Digest. She and I used to work together and when I wasn't running around the office bother people for information, Mackenzie and I would chat about her Fantasy Basketball team, which consisted mainly of Boston Celtics—a fact I always found funny. So, when it came time to to an NBA Season Preview, I knew she would be the perfect person to discuss the Boston Celtics. Besides doing a great job at Architectural Digest, Mackenzie has contributed to variety of other publications and keeps up a pretty sharp Twitter account that I recommend following. You can see the lights on top of the Old John Hancock building in Boston from all over the city, and every kid that grows up in the area learns a rhyme about them. Blinking blue, clouds are due. The last bit, said with the same rhyme-scheme-butchering cadence as “except for February with 28,” is witness to the fanaticism rightly associated with Boston sports. It’s bred into the area’s youth and upheld by its elders. We lose, we flip cars. We win, we flip cars. We march out of the TD Garden wearing the most unflattering shade of kelly green on our milky New England complexions. I should say that I am not a "classic" example of most of the above referenced “We”s. I went to college in Boston. Right on the World Series oh-did-you-need-to-go-to-class?-Because-you-literally-aren’t-allowed-to-cross Boylston-Street-for-the-next-hour-while-we-scream-Dropkick-Murphys-and-hit-you-in-the-face-with-our-brooms parade route. I maintain that Red Sox fans are always horrible, occasionally terrifying, and “Red Sox nation” is an imaginary land, unfamiliar south of Providence. Nonetheless, I wholeheartedly declare myself a Celtics fan. Admittedly, I was inducted at just the right moment, during the reign of the Big Three and the rise of Rondo. I’ve not yet been tested for fair-weather fanhood. But I suppose I bragged about my C’s enough that Matt recruited me to tell you a little about why they’re so miraculous. Here is what I know for sure. I’m not at all educated enough in the intricacies of the league to say why new Jason “Baby Ray” Terry will someday oust his namesake’s 3-point records*; who is too old and injured to trudge on for the duration of their overblown contract; or what on earth the addition of giant white person Darko Miličić—drafted between Carmelo and Lebron in 2003, and bumbling through obsolescence ever since—will mean. But here’s the beauty of the thing, Boston sports are not about pre-season statistical analysis and trivia trading. Sometimes they’re not even about being good at stuff. They’re just about everyone being completely invested in the same thing that they have absolutely no control over. 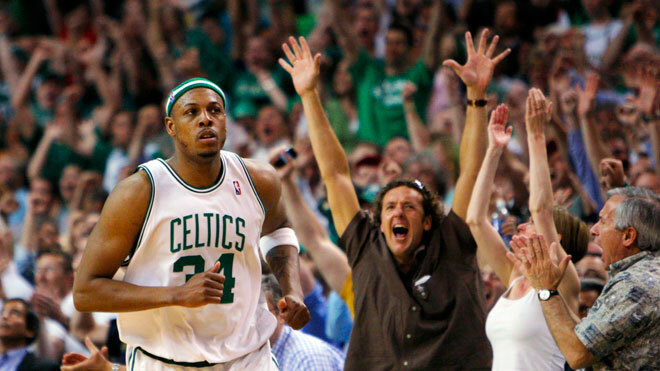 You choose to believe Jared Sullinger will be the next Pierce, even though you’ll be hard up to let Paul go. And you watch Rondo go from fresh meat to having his name preceded by “future hall of famer” on every mention. Two and a half months before Jason Terry would play his first game with the Celtics, he got a tattoo of their mascot holding the Larry O'Brien trophy. With an unquestioning faith (and lack of foresight) like that he should fit in quite nicely. Over eagerness. Blind dedication. These are the things Boston fans cherish. If this city’s indelible enthusiasm survived decades of Bambino cursedness, it can certainly make it through a few seasons of grandpa basketball unscathed.